With elegant appearance, fast disintegration and high bioavailability, softgel is easy to swallow, difficult to oxidize, convenient to storage and carry, thus becoming more and more popular with consumers. The softgel encapsulation machine can inject certain amount of oil liquid, suspension or mash into capsule to form sealed softgel with diverse size, shape and color. 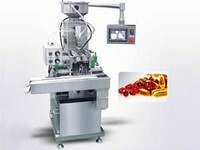 Because of its high productivity, accurate loading and stable performance, the encapsulation machine has been widely used in medicine, health care products, cosmetics, paintballs and other fields. Elaborately produced by using two patented technologies, our product has passed provincial new product appraisal and EU CE certification. 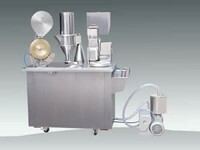 Our company provides RJWJ-115 and RJWJ-200 softgel encapsulation machines. 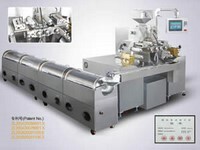 The RJWJ-200 softgel encapsulation machine can produce 300 million capsules per year. Due to the adoption of advanced linear drive system, the filling precision is ±2%. The success rate of encapsulation is over 98%. Automatic gelatin supplying and feeding systems can reduce labor intensity and improve working environment, better meeting requirements of GMP. The advanced processing and assembly technologies ensure stable quality of softgels. The optimally designed mould is made by high-quality aeronautical materials. Special surface treatment ensures long service life of the mould. Liquid level inside the gelatin box automatically remains at a constant position and thickness of the gelatin is shown on the dial indicator. Micro-oil technology is adopted for gelatin lubrication, minimizing oil consumption. There is no need to clean the softgel (unprinted) if lubrication uses vegetable oil. The softgel transmission device adopts U.S. FDA approved food conveyor belt which is non-toxic, non-stick and easy-to-clean. 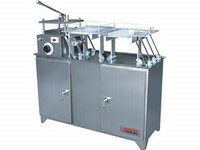 In addition, components of this softgel encapsulation machine that contact medicine and gelatin are made by non-toxic and harmless materials which will not shed fragments into the medicine, thus ensuring safety of the softgel. As a specialized softgel encapsulation machine manufacturer in China, Jiangnan Enterprise also offers automatic medicine packaging production line, automatic capsule filling machine, fluid bed dryer, medical mixer, and more.